The JVC KW-XR411 double DIN USB/CD receiver is RDS equipped and line outputs provide the ability to connect to external amplifiers. 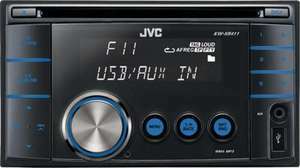 The JVC KW XR411 is an RDS equipped USB/CD receiver that will keep you entertained on the longest journeys. The KW XR411 with USB connection you can listen to an iPod for instance or plug other external sources into the 3.5mm stereo jack socket on the front panel. silly question but why's the front so big? Halfords with stock but for some reason doesnt let me reserve. anyone else having that problem? Tried 5 stores, none will let me reserve :S.
I fitted this last year in my stilo and paid £130, quality head unit well worth it at this price. Do you need a car for this ? If so can anyone reccomend any hot deals on cars? Maybe a package offer.. It's a good deal but for me bluetooth is a must these days so will pay a bit more and get one with bluetooth. scorching if you can get one. This may be a stupid question but I have a ford fiesta with a stereo control stick, would this system work with this type of setup. Is a better deal, single din (stick in a cubby hole box to hold your mp3 player nearby lol) and with bluetooth. In fact, I'm gonna post that! Ahh yes I had reserved this and then cancelled, the only problem with double din unis is that you can't remove the head unit and I just didn't feel safe having it in the car for the world to see. Just reserved one in Bracknell no probs! Don't get the point of double din without a big screen on it. I … Don't get the point of double din without a big screen on it. I think:http://www.halfords.com/webapp/wcs/stores/servlet/product_storeId_10001_catalogId_10151_productId_809277_categoryId_237503_langId_-1?cm_sp=Intelligent_Offer-_-Product_Details_Zone_1-_-Blank&iozone=PDPz1Is a better deal, single din (stick in a cubby hole box to hold your mp3 player nearby lol) and with bluetooth.In fact, I'm gonna post that! Urgh using a 3.5mm aux jack - nasty. I bought a smashing Alpine head unit from Halfords in the sale for £49.90 with USB port, whack your tracks on and pen drive and away you go. Even reads the ID3 tags and displays them, very impressed, no bluetooth though which I would have prefered. Could I do a swap with the stock Ford one I have in my C-Max? Double din's are the way forward, less attractive to theives, no need to carry your chav - style face plate around with your wallet, phone, glasses, tablet, etc etc. Also becoming ISO standard on cars. Exactly what i'm after but huge size of the unit wont fit my 04 audi a4, it there anything more suitable for this car? Does anybody know what the connectivity is like with a vectra c, 2004. What extras would I need? Faceplate, adapter? This may be a stupid question but I have a ford fiesta with a stereo … This may be a stupid question but I have a ford fiesta with a stereo control stick, would this system work with this type of setup. not gonna buy, but voted hot, great deal !! Hot deal. if halfords install as well. ordered one in newry northern ireland,but dont need it. Any experiences with Halfords instore fitting? I wanted to get fit with my Toyota Corolla 2001. If this had bluetooth or was bluetooth compatible i'd be on it in a shot! Like the Sony that "Awaken" has posted but would prefer double-din. Still tempted mind! Any experiences with Halfords instore fitting? I wanted to get fit with … Any experiences with Halfords instore fitting? I wanted to get fit with my Toyota Corolla 2001. Pretty quick and did a very tidy job fitting a jvc dab head unit for me at Christmas. "This is an ex display model that includes a 12 month return to store warranty"